Some instructors will use modules to organize the course. 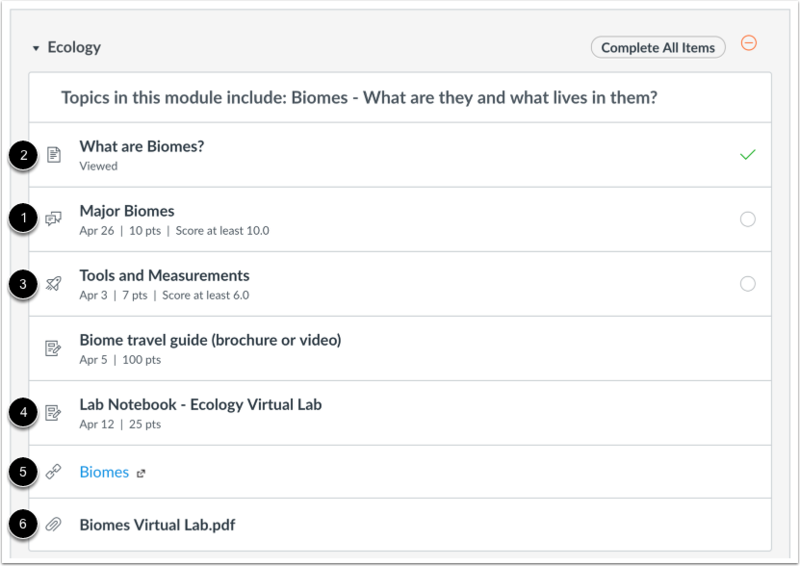 Modules control the entire flow of the course, along with its content. Note: Your instructor may choose to hide the Modules link in Course Navigation. 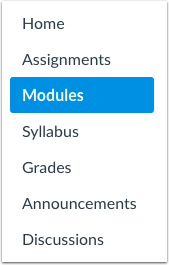 If the Modules link is not available, you can still access Module items through other areas of Canvas, such as the Syllabus or Course Home Page. Alternatively, your instructor may choose to hide all Course Navigation links except for Modules. If other Course Navigation links are not available, your instructor wants you to navigate the course using Modules. Your instructor may lock a module until a specified date. Locked modules display a Locked icon  and an unlock date . If a module includes requirements, the header shows whether you are supposed to complete all requirements or select one requirement . Next to the module item, you can view the type of requirement necessary to complete the module item . You must complete all required module items before you can progress to the next module. Some modules may require you to complete the module items in order. View: You must view the item. Mark as done: You must mark the module item as done before you can progress to the next item. 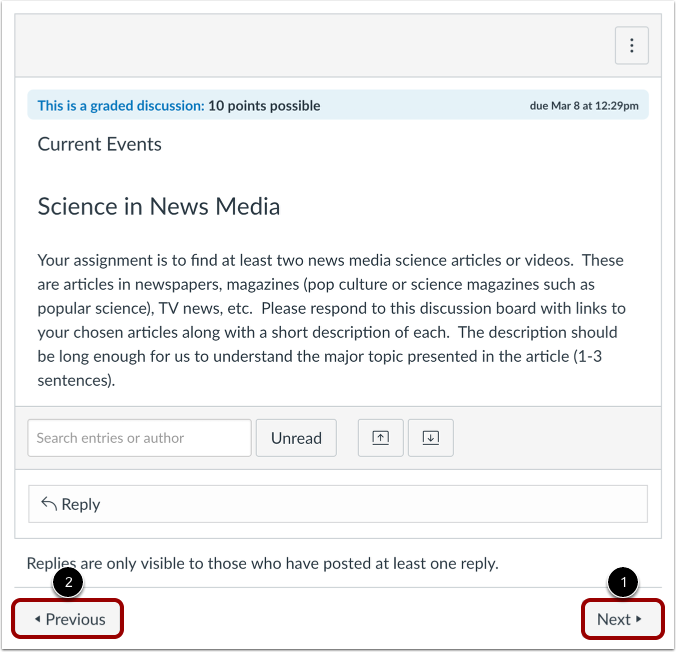 Contribute: You must post a reply to the discussion topic or contribute content to a page. Submit: You must submit the assignment, graded discussion, or quiz. Score at least X: You must submit the assignment with a minimum of the shown score. Module items can also be used to show progression through a module. Modules and/or module items that are not available to you are grayed out. For any module icon, you can hover over the icon and view the message for the requirement. Orange dash icon : when next to a module item, the module item is overdue. When next to the module heading, the module requirements have not been met. Green check mark : the module item has been completed. For requirements, this icon means the module requirement has been met. Blue info icon : the module item has been submitted, but has not yet been graded. Options label : the module item requires you to choose an assignment path before additional module items can be displayed. White circle : the module item has not been started. Lock icon : the module is locked until a future date. For prerequisites, this icon means the previous module has not been completed so it cannot be viewed. Lock message : the module may contain additional information that cannot be accessed until the name of the assignment in the message is graded. Each module contains module items. Each item includes the module item name . Items will display the due date (if any) , and the number of points the assignment is worth . If a To-Do date was added to a non-graded item, the date will display next to the module item . Note: If your instructor has placed an unpublished quiz in the module, you will not be able to see the points possible or the quiz questions until the quiz has been published. To begin a module, click the first item in the module. 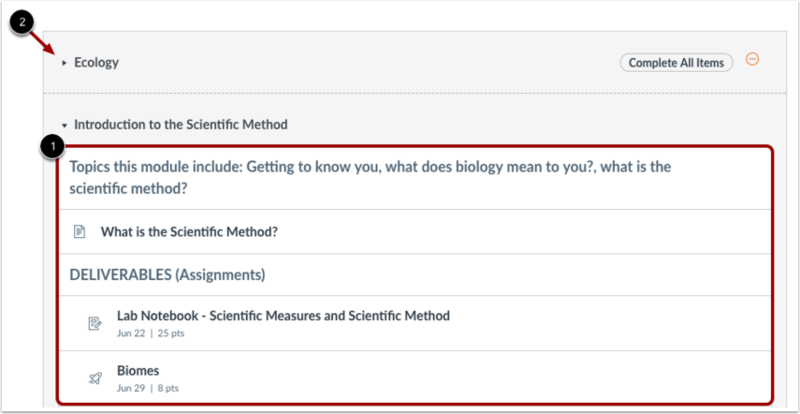 You can advance through module items or return to previous modules using the progression bar at the bottom of the page. To advance to the next module item, click the Next button . To return to a previous module item, click the Previous button . 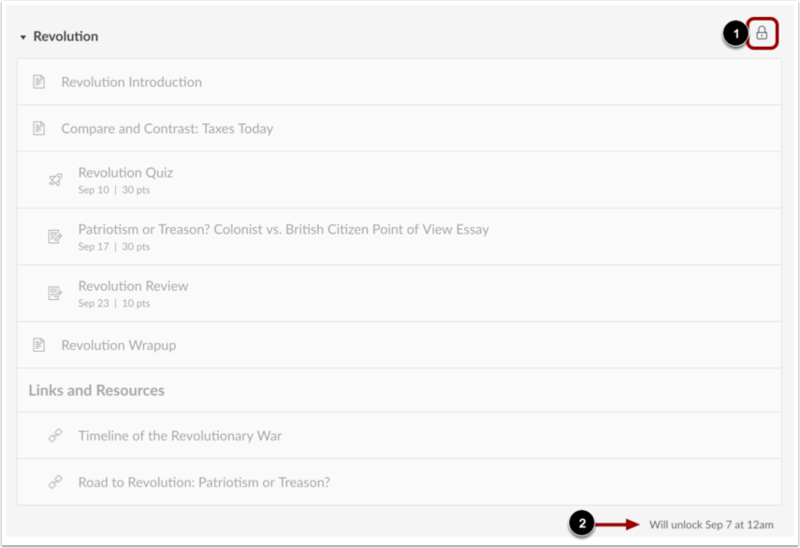 You can view the name of the next or previous module item by hovering over the Next or Previous button, respectively. 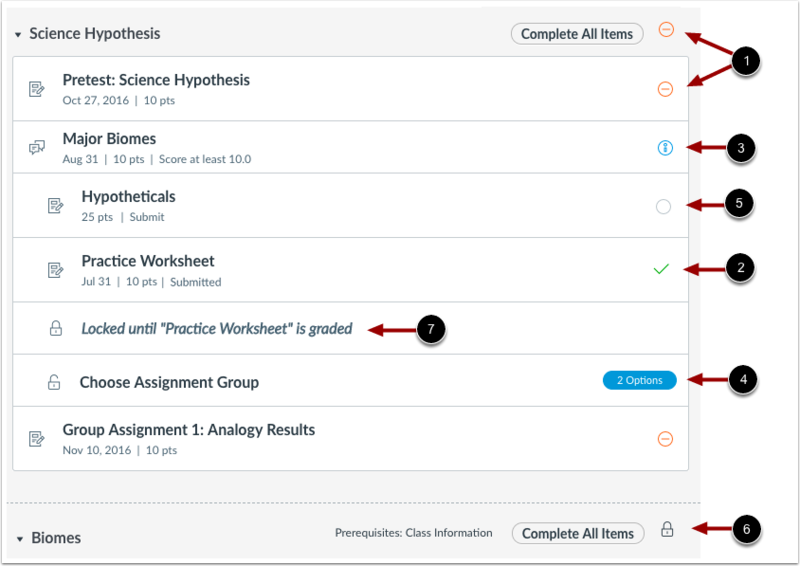 Note: If your instructor has enabled MasteryPaths for your course and an assignment is processing, the Next button in the modules progression bar indicates that you should refresh the page. This change notifies you about progressing to the next module item. Previous Topic:How do I view my grades in a concluded course using the New Gradebook? Next Topic:How do I mark a module item as done for a module requirement? Table of Contents > Modules > How do I view Modules as a student? Re: When a student completes and submits a quiz (or other assignment, for that matter) is there a way for them to get a "Thank you for your submission"